We work with families, health services, pre-schools and schools from pregnancy through childhood. Mentoring in the home to equip parents with the knowledge and skills to help their children develop. 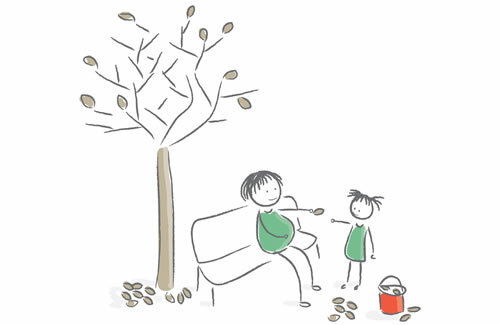 Positive parenting courses for parents of children aged two and over. Support for early years settings to achieve Síolta accreditation. Together with the UCD Geary Institute, we have followed the journey of these families to evaluate if our programme improves children’s school readiness and to understand the factors that make our work successful.The learning from this research phase will inform our work under the Area Based Childhood Programme. To read more about the Preparing for Life Phase I research, please click here. In 2013, we successfully applied for funding, to expand our prevention and early intervention work with children and families living in Dublin 5 and 17 under the Area Based Childhood Programme, funded by the Department of Children and Youth Affairs and the Atlantic Philanthropies. A home visitation and mentoring programme to equip parents with the knowledge and skills they need to help their child develop. Delivery of Triple P positive parenting courses. Support for the delivery of antenatal care & education in the community. A quality support programme for our partner early childhood settings. Coaching in speech & language development for our partner early childhood settings. An early years to school transition programme. Coaching for teachers in our partner primary schools in literacy, play and self-regulation programmes. In 2018, the ABC programme was aligned with Tusla and now operates under a service level agreement as part of the Tusla Parenting, Prevention and Family Support Unit. For more detail on our programmes under the Area Based Childhood Programme, please click here: What We Do.